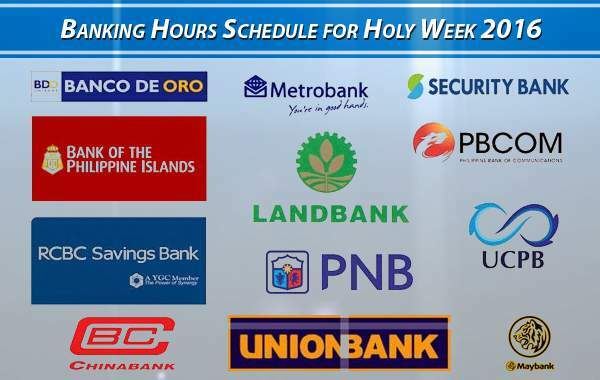 Banking Hours Schedule for Holy Week 2016 (BDO, BPI, Metrobank, PNB, PSBank, EastWest and other banks) - Balita Boss! Majority of the financial establishment will be closed during Holy Week 2016. Banks are operational from Monday to Wednesday, and selected branches will be open from March 24 (Thursday) to March 27 (Sunday), based on their advisories. Regular banking operations will resume on Monday, March 28. Selected branches of Metrobank will be operating on Maundy Thursday and Black Saturday. Check out the list here. According to their website, eastwestbanker.com, all branch stores will be closed on Maundy Thursday, March 24 and Good Friday, March 25. Selected mall-based branch stores, however, will be open on Black Saturday, March 26 and Easter Sunday, March 27, from 10 AM to 5 PM. Click here for details.